New reach truck models for both indoor and outdoor use are now available from Linde Material Handling in the 1.4 to 2-tonne load category. Equipped with large super-elastic tyres and featuring more ground clearance than standard versions, these industrial trucks can cope even with uneven or wet surfaces and are therefore ideally suited for the loading and unloading of trucks, as well as for use at ramps, high racks or in outdoor areas. 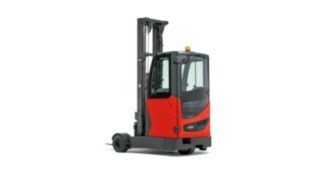 This flexibility makes these Linde reach trucks with super elastic (SE) tyres extremely interesting, for example, for builders’ merchants or DIY stores. Here items such as paints, tiles and electrical appliances are stored in enclosed salesrooms and halls, while building materials, gardening equipment and plants have their place on outdoor racks. In other fields, including for example food retailers, distribution service providers, building material manufacturers and companies in the metal and beverage industries, the robust reach trucks are needed to avoid additional interfaces between their warehouse, goods receiving and shipping areas. Operating these trucks in goods receiving and shipping too, they thus increase their productivity. New reach truck models for both indoor and outdoor use equipped with large super-elastic tyres and featuring more ground clearance are now available from Linde Material Handling in the 1.4 to 2-tonne load category. Optionally they are available with a modular weather protection. To meet the associated requirements, the new reach trucks Linde R14G-R20G feature load wheels with diameters of up to 458 millimetres, super-elastic tyres and mast ground clearance of 168 millimetres. In addition, they have a wider chassis of between 1,398 and 1,458 millimetres, a larger wheelbase and wider support arms. The elevated seating position for ideal load control can be comfortably accessed by the driver via an additional step on the chassis. On uneven surfaces the special drive unit suspension and the height adjustable air suspension seat deliver benefits to the operator. The position for optimum seat suspension travel adjusts itself automatically, depending on the driver’s weight. Moreover, new damping elements separate the workstation from the rest of the chassis, which additionally protects the driver against impacts and jolts. Equipped with a 6.5 kW drive motor, the reach trucks achieve maximum driving speeds of 14 km/h. Available in three different performance modes, the trucks offer a choice between maximum handling capacity and minimum power consumption. And they come with numerous options too: For example, the torsion-resistant tilting masts can be fitted with standard masts or triplex masts. Both versions offer the driver a wide view of the lift mast which is up to 7,700 millimetres high. Another feature is the optionally available modular weather protection. The basic version has a cab fitted with safety glass towards the mast side. A further configuration is equipped with additional glass windows at the sides and the full protection version comes with a glazed door, cab lights, heated front and rear windows as well as a bumper on the door. All versions of the weather protection cab feature a 28-millimetre reinforced glass roof as standard and, depending on the model, wipers and spraying system for all glass panes. The windshield door is another optional feature. Even without glass windows, it ensures enhanced comfort, as it protects the driver’s legs from unpleasant draughts.